During my recent move I uncovered some fountain pens that I have not used in over 10 years. One of these was a large Récife fountain pen. 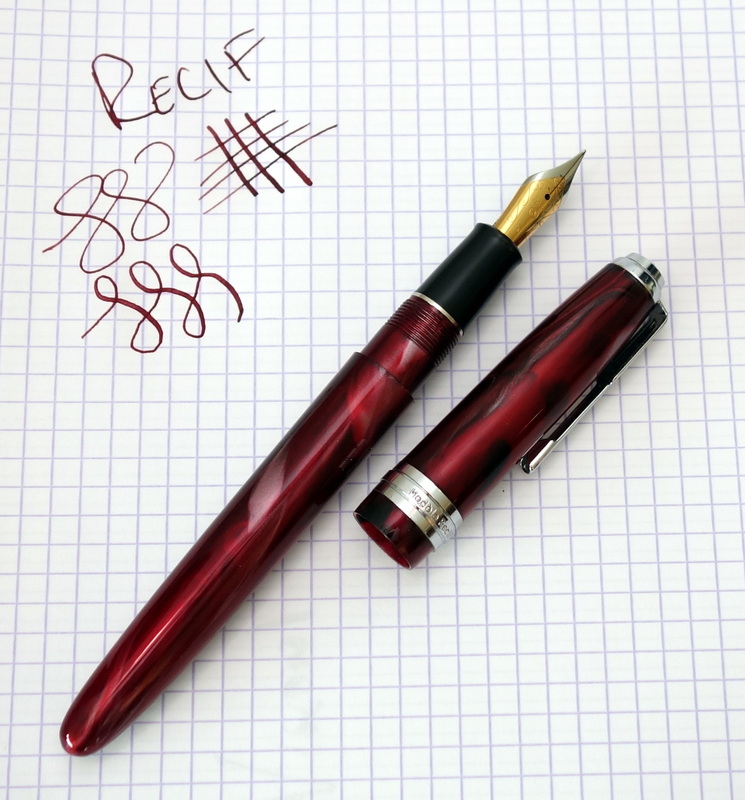 Many of you may be unfamiliar with this French brand as it is not regularly discussed on pen blogs and pen forums but the brand does still exist and the pens they produce today seem to be largely the same. The red swirled acrylic body is big and beautiful. The pen measures 6 inches long capped and with brass threading weighs 35.2 grams. For such a large pen it is well balanced and I am able to use it comfortably both posted and unposted. The silver metal trim doesn’t seem to be fitted with much care as the words “Modele Recife Depose” are badly off center from the clip. I have to say I am also not a fan of the Art Deco style clip; it looks cheap. The large steel two-tone Jowo nib isn’t a stunner but it is surprisingly springy and I was able to get a decent amount of line variation out of the nib. The nib isn’t the smoothest and it writes rather fine for a medium point. Today these pens go for $125+ and there are a lot of great pens for the same money. 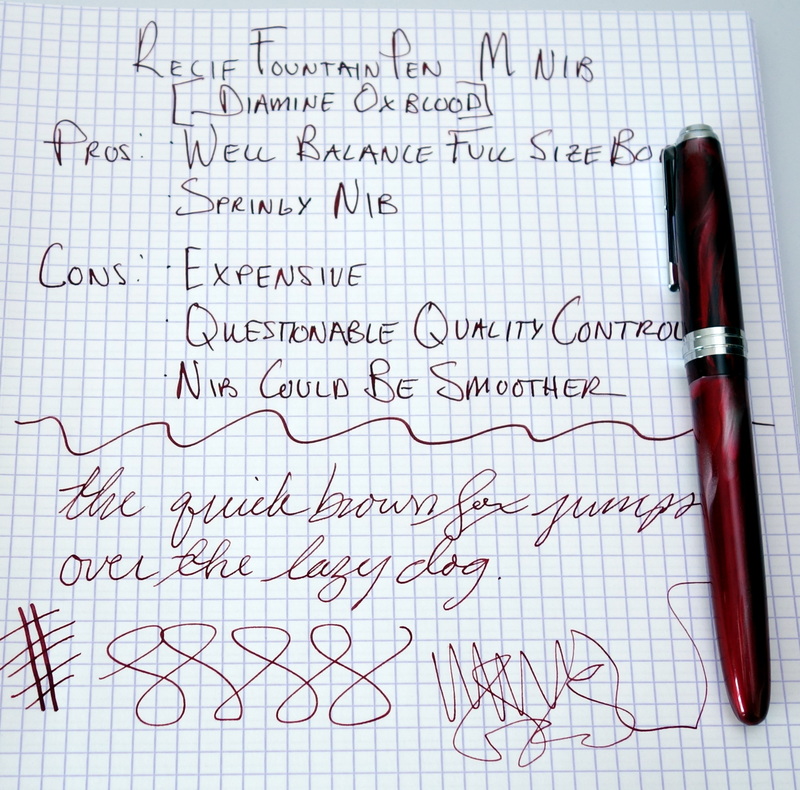 You could get a pen with a piston filling mechanism like a Pelikan M200 or a pen with a solid gold nib like a Pilot Custom 74 but if you want a big brightly colored body with a springy nib the Recife may not be such a bad option. Next Post Aurora Optima Repaired and Back From Italy!